"I think the answer is probably a scaled-down version of some of these palaces that are being built around the country," Buffalo Bills co-owner Terry Pegula told reporters Tuesday night as the NFL meeting at the Arizona Biltmore came to a close. "The thing (Rams owner) Stan (Kroenke) is building in L.A. is amazing, Jerry Jones' facility in Dallas. So we need to do something that's Buffalo style." However, Pegula stopped short of saying he favored building a new stadium over renovating New Era Field, deferring to the results of a market research study Pegula Sports and Entertainment commissioned from CAA ICON to help determine the best option. He said those results would be available in the summer. "It's pretty extensive, the work they're doing," Pegula said. "I can't comment on what the results are because I don't know. We have dribs and drabs of what they've seen so far, but we're open to any option and we'll see what the market study says. ... We're waiting for our study to come out to see what all they tell us what our market can support." Kim Pegula, Terry's wife and co-owner and president of the Bills and Sabres, said a survey conducted by CAA ICON has drawn 30,000 respondents. "The hockey and the football side have both really come out, had a say in what they're looking for, as well as our corporate partners," she said. She said PSE has also been utilizing focus groups in its studies of what to do with facilities for football and hockey. "That study is still in its early phases," Kim Pegula said. "It's going to take a while. And this is just our own study and I'm sure there's going to be others and there's going to be more hands in that jar trying to work on a plan. I'm looking forward to seeing what they have, but we are, at least, taking those steps early on." Both Pegulas said they did not know how much taxpayer money would be involved. Kim Pegula added, "One of the owners of ICON really very much opened my eyes when he said, 'Listen, this is going to be one of the biggest, most impactful projects to come in almost 50 years by the time we get around to it.' He said, 'Just make sure you keep your eyes wide open. I know we all came in with some preconceived ideas of what it might look like, how much it might cost, where it should go, all those things. Listen, keep your eyes, your ears, your head wide open because this is going to be a game-changer for Western New York. So I'm not going to put any numbers, anything on it." Asked if he wanted a domed stadium, Terry Pegula initially said, "No," then said, "We'll see what the study says. It's all about what we think our fans want, what they would prefer." Terry Pegula said the NFL "more or less" wants to "see something done one way or the other." He added, "We're one of the smaller markets and any way we can increase our revenue, they're for it." Asked if he would be willing to foot the bill for a new stadium, Terry Pegula said, "I don't know." A 'Buffalo style stadium' could be in our future. What does that mean? Terry Pegula and his wife, Bills and Sabres co-owner and president Kim Pegula, both expressed disappointment with the hockey team's collapse after a strong start. However, neither said a coaching change was forthcoming despite the Sabres missing the playoffs for the eighth year in a row and second season with Phil Housley as coach. 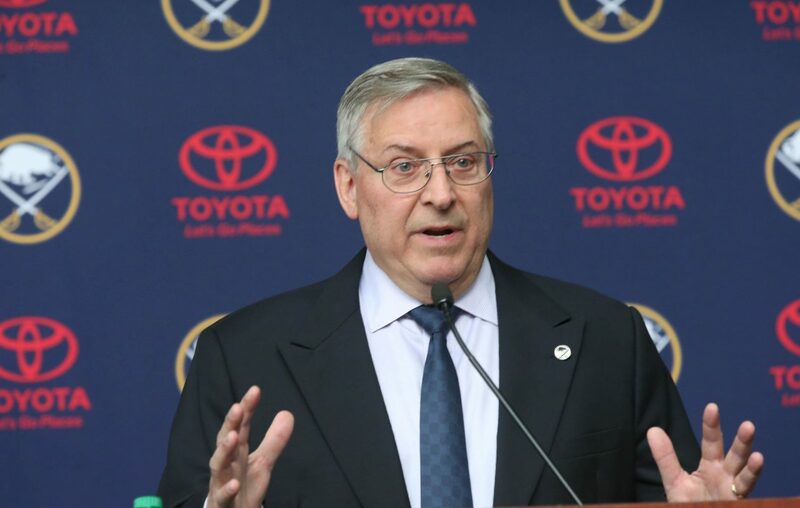 "I think (General Manager Jason Botterill) has said it pretty well that he supports Phil," Terry Pegula said. "Phil communicates with the players well. Are we happy with how the season is going? Absolutely not. You can ask anybody on the team. So something has to change, we don't know what, but we're all going to put our heads together and talk about it." Asked if he felt he could justify bringing back Housley, Terry Pegula said, "Yeah, yeah, yeah. He's a young coach and he was a great player and I think he can grow as a coach." "We have a lot of good, young talent. We've got two of them that are potential superstars with Jack (Eichel) and Rasmus Dahlin, so those are two pieces that a lot of teams would love to have and we have them in Buffalo so we'll build around that foundation." Terry acknowledged that the frequent coaching changes that have been made with the Sabres and Bills have played a role in wanting to maintain stability with Housley in particular. "Yeah, we talked about consistency," Terry Pegula said. "You look around both leagues, the National Hockey League and the National Football League, and the teams that have the consistent management teams seem to fare better. I always say like the Patriots, with (Bill) Belichick and (Tom) Brady, it's like going to McDonald's and getting your coffee in the morning. It's the same. Or Tim Hortons. You know what you're going to get every morning and those guys, they've been together so long, they're hard to compete against." Terry said he didn't think the Sabres needed to add another layer of experience to help with their efforts to improve. "I communicate with Botts regularly, daily, sometimes three times a day," Terry Pegula said. "He's the only three-time, gold-medal World Junior guy in the world. He's a smart guy and he does a good job." Terry Pegula said he doesn't regret the Sabres, after their 10-game winning streak early in the season, not doing more to enhance their roster to make a playoff run when they ranked among the better teams in the NHL. "We knew at the time when we were No. 1 in the Eastern Conference, we said, 'We're not this good, we'll come back to earth some.' Now, did we think we'd come back like this? No. At the time when we were 17-6-2, we didn't think we were the No. 1 team in the Eastern Conference. I think our guys have showed one thing: at one time, they were. They just need to now continue and do that over a longer period of time." Asked what gives him confidence that that can happen, Terry Pegula said, "The team is so young. And I know it sounds like a cop-out, because there's young teams that are winning. We're one of the youngest teams in the league. Young guys make mistakes that sometimes they shouldn't, but they grow." Speaking publicly for the first time since a series of changes at the top of PSE, Kim Pegula – who her husband said is more focused on what happens with the business aspect of the company than he is – said the moves weren't prompted by any single factor. She said the time that has passed since 2014, when the Pegulas bought the Bills, has allowed for more opportunity to find the best way to collectively run the franchises. "When we bought the team, we kind of took on a lot of things that had been going on for many years and, of course, we did make some changes," Kim Pegula said. "But it isn't until like – I think this is our fourth year, four and a half years (of owning the Bills) – it takes a while to just understand your organization and the people behind it and even just knowing how we want things to be done, how we want things to be structured. And I think just now it was the right time, once (former Bills and Sabres president) Russ (Brandon) departed earlier last year and I became president, it just allowed me to get a little bit more deeper into the organization. "It really is a matter of wanting to kind of put my own stamp – not just myself, but Terry and I, our own stamp on the organization, how we want things to be structured and run. And now that we've got several years under our belt of knowing more and having more information." • Brandon resigned after an internal investigation into his workplace behavior and allegations of personal misconduct, The Buffalo News reported per two sources. • Last January, senior vice president of administration and Harborcenter GM Mike Gilbert and VP and Harborcenter director of hockey Nik Fattey resigned after an internal investigation into whether they sexually harassed female employees after a holiday party in December, four sources told The News. 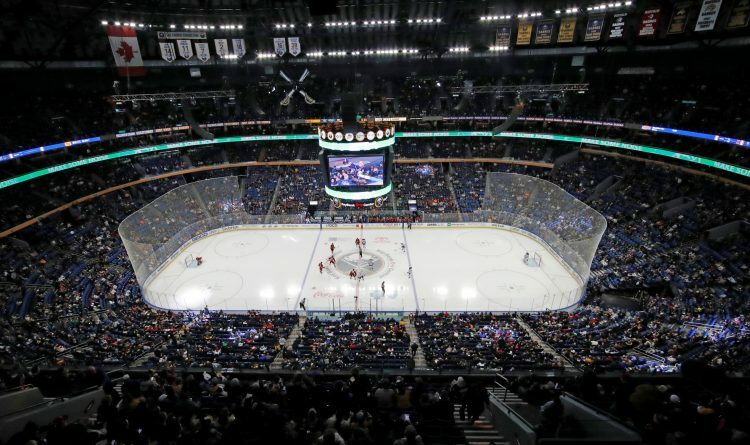 • In late February, PSE announced that three executives were leaving the organization: chief executive officer Bruce Popko, executive VP and Sabres chief administrative officer Brent Rossi, and executive VP of business development Erica Muhleman. Asked if she thought PSE had a "cultural problem," Kim Pegula said, "No, I don't think it was culture. I don't think it was one thing. It was a lot of different things. Some of it was just based on, whether it was work-related, whether it was just a restructuring. And I've been talking to a lot of clubs around the league, 'How are you doing things?' So, for me, it was part of the learning process. It is part of the whole progression of how we want things to be and how we want to make our own mark." She said she doesn't yet know how she wants the organizational structure to look. "I'm still learning," Kim Pegula said. "And now that there's been a couple of layers that have been taken away has just allowed me to learn more and understand more. Right now, I don't have a timeline." Terry Pegula had nothing but praise for the efforts of Bills coach Sean McDermott and General Manager Brandon Beane. "These guys work and they're smart," he said. "They put the time in and we talk a lot. There's such good communication between all three of us and Kim. It's just fun to be there and work with those guys. If they can communicate with me, I know they can communicate with the players and the staff. There's a good vibe over there."